Panasonic has today announced a new HD camcorder that is waterproof and has a pistolgrip. 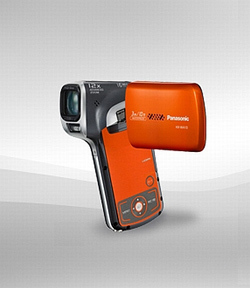 The HD camcorder is called Panasonic HX-WA10 and is able to withstand depths down to three meters for up to an hour. The HX-WA10 is able to record Full HD videos with a resolution of 1920 x 1080 and 16 megapixel still photos. Other specifications is 5x optical zoom, 2.7″ TFT LCD screen and it comes with the HD Writer VE 1.0 software that lets you upload videos to Facebook and YouTube. Panasonic has not announced a price or when the Panasonic HX-WA10 camcorder will be for sale on the market. New Waterproof Full-HD Camcorder HX-WA10 enables users to shoot both photos and videos in high quality. Panasonic today announced the release of the new waterproof Full-HD Camcorder HX-WA10, which allows easy, effortless photo and video shooting. The WA10 is also optimized for shooting outdoors and in rainy weather. It captures stunning, detailed images with Full-HD 1920×1080 resolution, thanks to Backside Illumination (BSI) technology for shooting in dimly lit conditions, and 16-megapixel still image recording with top-class digital camera quality. This lets users easily enjoy authentic HD shooting in a wide range of situations. The MPEG-4 AVC file format (MP4) is convenient for uploading and editing images with a PC or the Internet. Blog and SNS handles are also easily used. Operation of the WA10 is very very easy thanks to the included HD Writer VE 1.0 software, which is compatible with both YouTube and Facebook, With the release of this new multi functional camcorder, Panasonic offers users the ability to shoot Full-HD videos and high-resolution photos, even during rugged outdoor, recreational and everyday activities. The WA10 can be used to a depth of 3 meters underwater for up to 60 minutes4/5 complying with IPX8 standards. 4. Must be placed in dry conditions for more than 10 minutes after being used in water for 60 minutes. 5. This doesn’t guarantee no destruction, no malfunction, or waterproofing in all conditions. The BSI (Backside Illumination) sensor technology has improved the sensitivity of the CMOS sensor, making it possible to shoot images with high-resolution Full-HD quality even in dimly lit areas. Full-HD video (1920 x 1080 pixels) can also be captured in all kinds of year-round outdoor conditions, not only in the rain or while swimming in a pool or the ocean, but also during marine sports6 such as snorkelling and surfing, and winter sports like skiing and snowboarding. The PC-friendly MPEG-4 AVC file format (MP4) makes it super easy to load and edit data with a PC. It’s also hassle-free to directly upload video clips to YouTube or Facebook with the included application after editing. 6. When using the camera in sub-zero or hot and humid conditions, be careful of condensation. 7. Varies depending on the Movie mode used for shooting. – Capable of shooting faraway subjects with an optical 5x zoom/12x Advanced zoom for movie recording. 9. The functions included in iA may not be applied when conditions do not call for them. 10. An HDMI mini cable is not included.